At Blue Angel Café, one never questions what time it is in London , Cape Town , Auckland or Melbourne , as four mounted wall clocks inform customers of such continental times. These clocks also keep the Angel’s British owner, South African chef and Australian events coordinator from phoning their parents back in the homeland at an ungodly hour. 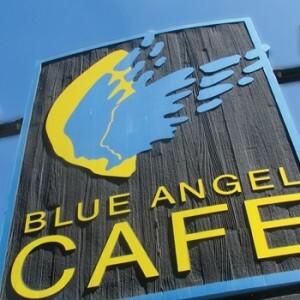 With so many world-traveling influences having a hand in the vision of this café, it was undeniable that Blue Angel would thankfully develop an international menu, featuring healthy Mediterranean, Greek, Japanese, Mexican, Vietnamese, Tibetan, Thai and Vegetarian entrees. 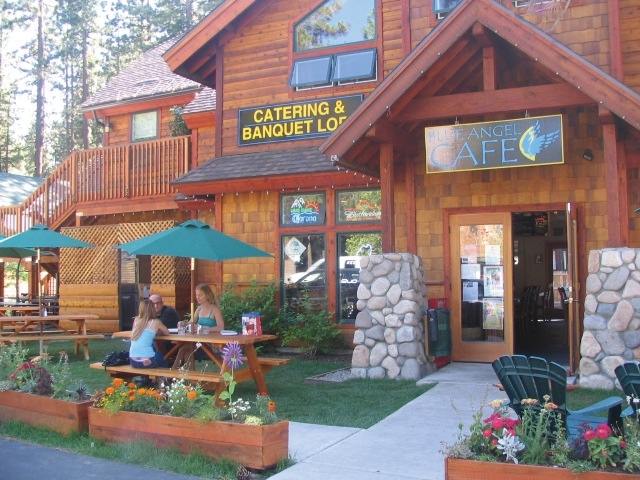 During the winter, Heavenly’s staff, especially the ski instructors, race down the mountain for happy hour mimosas and a spot on one of the café’s leather couches, which become comfortably warm next to the stone-wall fireplace. Make your après ski appearance a regular at the Angel. Not only will you benefit from an extensive hot drink list, eclectic appetizers, and a tight-knit group of loyal locals, but you will obtain a history lesson on how difficult skiing used to be pre-parabolic skis, from the Angel’s showcased, wooden stick skis circa 1930.